Zaid Hamid said in an interview (private) he gave to students of Shifa College of Medicine Islamabad that he met Yusuf Kazzab in 1992 in Karachi and after that shifted to Rawalpindi, so he is not aware of what corruptions Yusuf Kazzab might have done after 1992. As usual, Zaid Hamid lied blatantly instead of acknowledging the fact that he was in constant contact with Yusuf Kazzab and acted as his main Sahabi / Khalifa, and that Yusuf Kazzab used to live with Zaid Hamid when he was in Rawalpindi, for extended periods of time, even conducting his ‘majalis’ (gatherings) at Zaid Hamid’s residence. 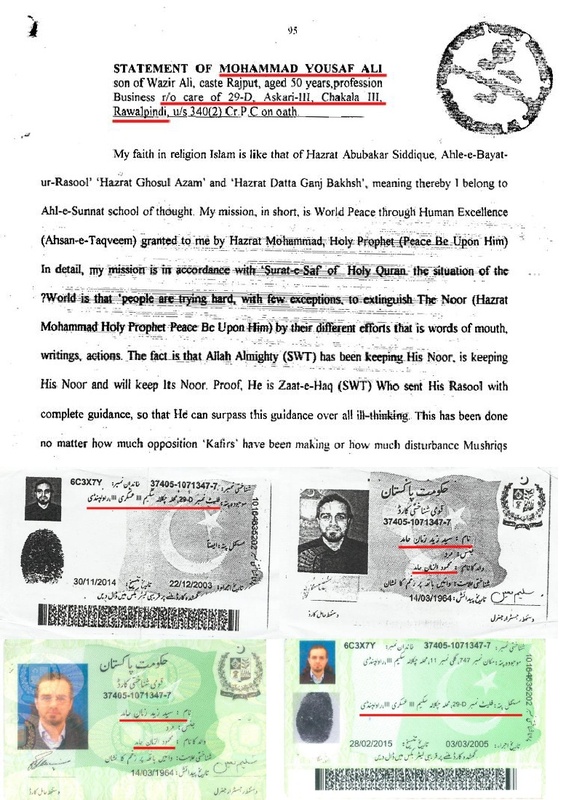 The following document shows the address of Zaid Hamid given with Yusuf Kazzab’s name (on page 95 of the court verdict of Yusuf Kazzab’s blasphemy case). This is just one of the evidences which proves that Yusuf Kazzab used to stay at his Sahabi-e-Awwal Zaid Hamid’s residence when he visited Rawalpindi, and was VERY close to him. Zaid Hamid has lied to such an extent and changed his stances so much (to defend Yusuf Kazzab in order to save his own hide) that now it is impossible for him to keep on hiding behind his huge pile of lies and fraud. This entry was posted in Exposition, Lies Unleashed and tagged blasphemy, Emaad Khalid, lies, Pakistan, yusuf kazzab, zaid hamid.